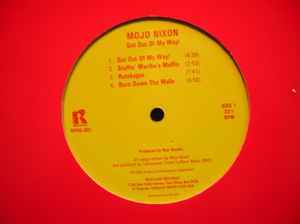 Mojo Nixon ‎– Get Out Of My Way! Recorded at Sound Affair, except tracks B2 and B3 recorded at Hit City West. This album came in a generic Enigma Entertainment sleeve, which is red & has the Enigma logo printed in white on both sides. No mention is made of Skid Roper on either of the labels.